Or how I spent my New Years Holiday. 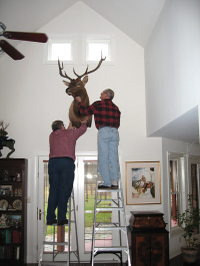 What do you do when you have the head of a very large animal to hang "in the house"? Spousal distress is high, but the team of Bob and Larry was not to be distracted from the mission at hand. With ladders under us, and a determination to welcome the newest member of the family into the household, we tried all cardinal points of the compass to find the optimal location for the trophy. East wall, then West, then North and South; each was a candidate. We would climb, head in hand, and hold the proud mount while the females would stand back and move about studying the proposal from all angles before pronouncing their verdict. A decision was made and now when you enter the home of Pris and Larry. The prize of the mighty hunter greets you, its welcoming message left to the imagination of the guest.